Newspapers: 'Whistle-Blower' Snowden Deserves Clemency : The Two-Way The New York Times and Britain's The Guardian have published editorials saying accused spy Edward Snowden has sparked an important debate about the proper limits of electronic surveillance. 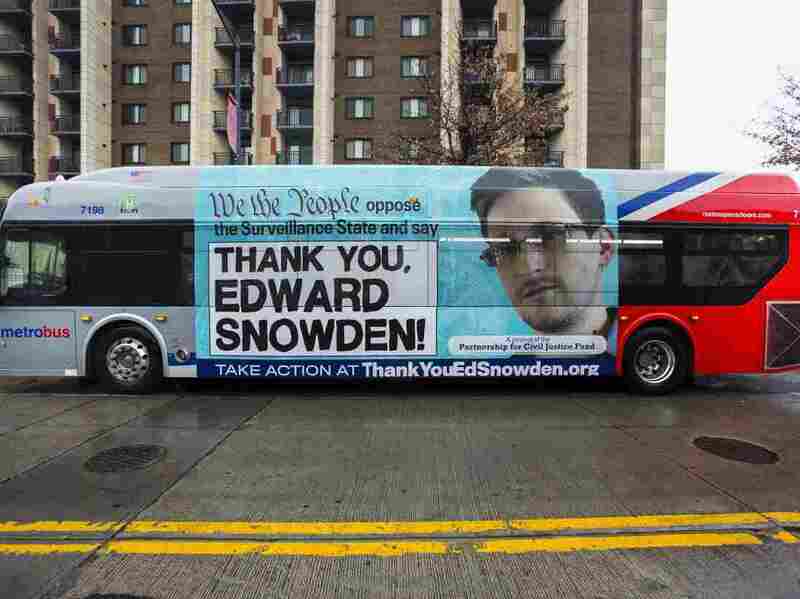 An advertisement thanking NSA leaker Edward Snowden appears on the side of a Metrobus in downtown Washington, D.C., in November. "Considering the enormous value of the information he has revealed, and the abuses he has exposed, Mr. Snowden deserves better than a life of permanent exile, fear and flight. He may have committed a crime to do so, but he has done his country a great service." "Mr Snowden — through journalists, in the absence of meaningful, reliable democratic oversight — [has] given people enough knowledge about the nature of modern intelligence-gathering to allow an informed debate." In editorials published late Wednesday, the two papers — both of which have been on the receiving end of Snowden's leaks — called for clemency for him. Snowden was charged in absentia in June with spying and theft, soon after he was revealed as the source of information for a series of exposes first published last summer by The Guardian. In its editorial, the Times called Snowden a whistle-blower whose leaks sparked an important debate about the proper limits of electronic surveillance. "The debate that Mr. Snowden has facilitated will no doubt be argued over in the US supreme court. If those justices agree with [President] Obama's own review panel and Judge Richard Leon in finding that Mr. Snowden did, indeed, raise serious matters of public importance which were previously hidden (or, worse, dishonestly concealed), is it then conceivable that he could be treated as a traitor or common felon?" The British newspaper said it hoped "calm heads within the present [U.S.] administration are working on a strategy to allow Mr. Snowden to return to the U.S. with dignity, and the president to use his executive powers to treat him humanely and in a manner that would be a shining example about the value of whistleblowers and of free speech itself." But the paper also said it was hard to envision President Obama giving Snowden "the pardon he deserves." After months of revelations attributed to documents Snowden stole when he left U.S. government employ and took refuge, initially, in Hong Kong, he told The Washington Post, "For me, in terms of personal satisfaction, the mission's already accomplished." " 'I already won,' he said last month in a telephone interview from Moscow, where he is currently residing in self-imposed exile. 'As soon as the journalists were able to work, everything that I had been trying to do was validated. Because, remember, I didn't want to change society. I wanted to give society a chance to determine if it should change itself.' "